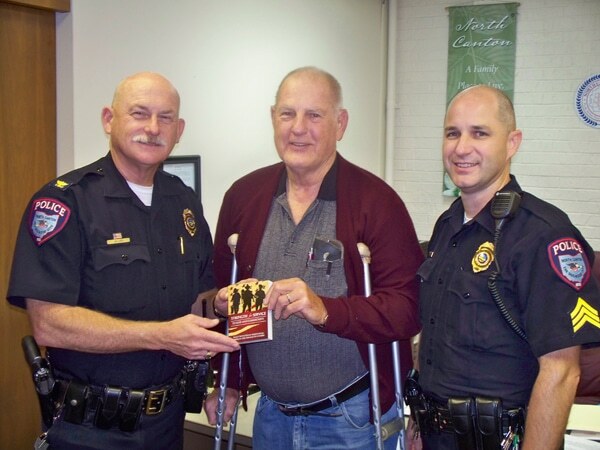 Four United Methodist Churches in area presented over 137 “Strength for Service to God and Community” devotional books to first Responders in the City of North Canton Police Officers and Fire Department personnel. Books were also given to Plain Township First Responders. United Methodists Churches contributing to the devotionals were Faith UM Church Stevens Ministry, Grace UM NETS Ministry, Simpson UM Church and Werner Church Road UM Church. Non-church contributor was CMG Business Concepts in Middlebranch. Leland Spencer who is President of the East Ohio United Methodist Men, adds,” This devotional is backed by the General Commission of United Methodist Men and is distributed daily” “I would like to see this book gets into the hands of every First Responder in East Ohio,” he added. A church in Youngstown area just completed giving to a unit in their area.